19 years of marriage under the bridge, just like that. It's amazing how time has slipped by, just like a babbling brook over my dangling feet, naturally and without fanfare. Still, looking back, we have so many memories. And all those times that seemed so troubling and desperate while we were in them seem like mere traffic bumps with the distance of time. I can honestly say that I married my best friend. We could talk forever without running out of things to say, and then again, we could just as happily sit and say nothing at all. Sitting and talking (or not) is just what inspired my new anniversary illustration. I think my hubby and I could pass several contented evenings rocking out on the porch, just listening to the rhythmic lapping of the waves and the blinking of the lighthouse. Now, I'll be honest, our real dream is a log cabin on a mountain top somewhere overlooking a lake. It's odd, but when we shared our dream home ideas years ago we both had the same idea, despite growing up on opposite sides of the world. We were at a marriage conference several years ago and the speakers suggested that our spouse was 'our perfect gift from God'. Some people may not see that at the moment, but the longer I work at marriage, the more I see the truth in it for me. We are yin and yang, the perfect compliment for each other, with each having a strength where the other has a weakness. It's a partnership, and I am so grateful for it! I can see why God talks about us being brides to Christ -- I have found marriage to be a real symbol of my relationship with the Lord. It is the secure foundation on which the rest of my life is built, the place where I can feel safe, where I know there is unconditional love. Dearest Father, thank you for the gift of marriage. Thank you for my husband and for the children he has given me. Thank you for the friendship, the partnership and all the lessons about love it has, and continues to teach me. Amen! This weekend, while daddy was still away but the weather finally got warm, my son prodded us all to go for a walk in the woods. If you haven't done that in a while, I highly recommend it -- especially with kids. It's a wonderful opportunity to teach them about nature, which, for us at least, usually leads to discussions about the wonders of God, and the ways of the world. Kids have so many questions, and they frequently make my head spin by asking disjointed questions in rapid-fire succession, such as 'why are the gas prices so high now?'... 'can we eat those mushrooms?'... 'why does moss only grow on the north side of tree?'... 'will our dogs be in Heaven with us?' I like to give thorough, thoughtful answers, but on these walks we usually just throw out theories. The kids don't seem to need to know the answer, they frequently are happy just to think there IS an answer. Now that my oldest is 14 and in high school, he likes to be the expert, sharing his recently acquired knowledge of government and nomics in a most scholarly way. On this trip we took the dogs, and Bri brought a camera to 'take only pictures, leave only footprints' as her school is currently very eco-friendly. Aside from a slightly twisted ankle and some soreness in my back (from suddenly twisting the wrong way on a steep part) it was a pleasant way to spend the day. A little dam construction on the stream at the end of the trail (and an inadvertent swim for Bri), and we were all ready to head home. There was a lot of fuss in Heaven when God created the earth and everything in it. That must have really been something - to hear the stars singing and angels rejoicing. I suppose we might get to hear something like that again when Jesus comes back to claim the earth in glory and splendor. In the meantime, despite all our sinful attempts to mess it up, the world is still a beautiful place. Spring mornings with the birds singing, the smell of newly mowed grass, the scent of flowering trees and shrubs wafting through the air. The gentle steady patter of a Spring shower or the fury of a fast moving thunder storm...in any case, God's creation is awesome. I really like the Psalms where the earth is shouting or the sea is resounding. For instance, 'let the rivers clap their hands, let the mountains sing together for joy;' (Psalm 98:8) It's that kind of uncontainable joy that I sometimes feel when I consider my Father's world. I have numerous family vacation photos as a screensaver, and every once in a while a photo from the top of the Rocky Mountains or Grand Tetons pops up and my heart leaps with awe at the splendor. Those views, as I experienced them, literally took my breath away. I didn't dance for joy, but perhaps I should have. King David was a man of emotion. He was always singing, playing music and dancing in praise of God. I've been pretty restrained most of my life, but lately I've been thinking that's a mistake. I think the world would be a happier place if people hugged more, cheered more, danced more, laughed more and expressed their feelings more. Perhaps if people could express their joy more fully, they wouldn't have so much pent up anxiety or anger. I don't know, I could be wrong, but it just seems to me that in this short life, you should take advantage of all the moments you can to enjoy the world and the people around you. It's easy to be cynical and critical. I spent much of my youth like that. And I was excellent at it. I had a biting wit that could cut right to the heart of things. I never noticed the wounds I was inflicting all around me. Of course, I had my own wounds to deal with... I see this same temperament in my son. And he has his scars, too, but I'm praying that the Holy Spirit will keep working in him to bring about change. I have found that only Jesus can heal those kinds of wounds and scars. Let go of the hurt and pain, and let God bring you peace and perspective. There is so, so much to be thankful for. Lord, thank you for the beauty of the earth, and for joy. Thank you for dancing, singing, playing music and all the other ways we can express our joy. Help me to avoid a critical mindset, and create in me an attitude of gratitude for the countless ways You shower us with Your grace, mercy and love. Amen! Well, I've been so busy with my own contests lately, that I completely forgot that I entered one myself on www.snaptotes.com . It was a Mother's Day contest, to submit a family photo and if you won, you'd get it printed on your very own purse or tote. AND I WON! 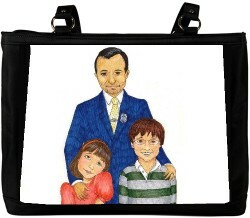 I submitted my own drawing of my family, which I did for Father's Day one year, and my tote should come out looking a lot like this. Wow, I'm really excited. I purchased another purse from them and I really love it, but it's a little pricey for me. The one I won sells for $120! And, on a roll about winning, check out what Cyndi at By Light of Moon had to say about the Visions & Verses Prayer Journal that she won in April's contest. A fellow animal lover and lover of God, I'm sure she'll put it to good use! I haven't heard from two of April's winners yet. I don't want to draw again unless I have to. I've emailed them several times. If your name is on the April Winner's list (see comment under Contest page), then get in touch with me soon, please. Perhaps you gals in the blogesphere can give me some advice on how to handle this? For the rest of you, please click on the Contest page to the left, or the website link to the right, or this here link: Contest, to sign up for May's contest. I'm giving away a mug and some card sets. If you've already signed up, you're automatically entered for this month too. All your information is safe with me, and you can unsubscribe later if you really want to. 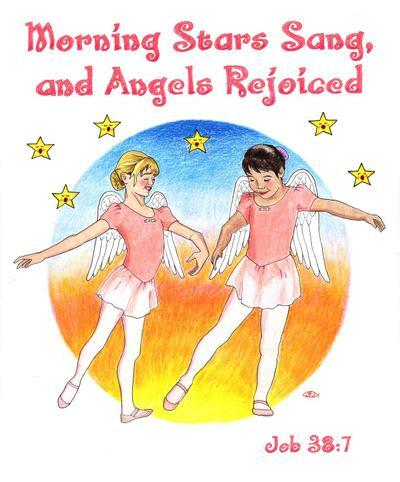 Thanks to the Lord, for He is Good, He renews His mercies every morning. There is so much to be grateful for in this life, and I know that winning a little tote isn't all that major, but I would be remiss if I didn't stop and praise God for that blessing anyway! All Hail the Unsung Hero: Mom! I didn't really mean for my last post to be my Mother's Day post, but I suppose I said my peace about the high calling of Motherhood there. So, I thought, in the tradition of mass emails, I'd just share a bunch of my favorite quotes about Motherhood. After all, it is my love of pithy quotes and poignant verses that started this whole thing anyway! A famous pediatrician was asked by a mother what was the best time to put her children to bed. He replied, "while you still have the strength." Something has been discovered that does the work of five men -- one mother. When you were small and just a touch away, I covered you in blankets against the cool night air. But now that you are tall and out of reach, I fold my hands and cover you in prayer. For the joy of human love, brother, sister, parent, child, friends on earth and friends above, for all gentle thoughts and mild, Lord of all to thee we raise, this our hymn of grateful praise! Amen! I've been reading my favorite blogs today, and they all came together to remind me what a blessing it is to be a wife and mother. 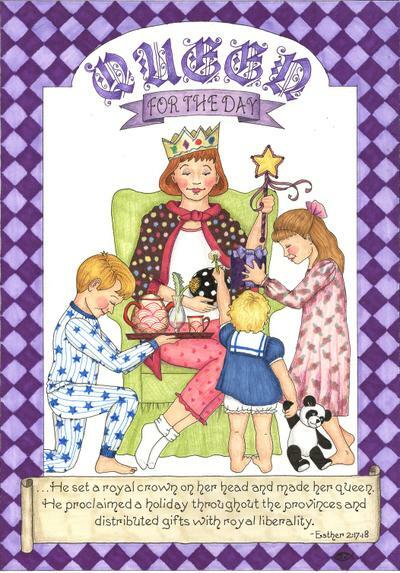 The card companies can put such a sentimental glow on motherhood, that it almost loses it's meaning. Those 'in the trenches' know that it isn't all tickle fights, day trips and imparting life's wisdom. Much of caring for kids and husbands can be drudgery, that's why they call it houseWORK. But it's oh, so worth it! Lorie, at Encouragement From My Heart, is sponsoring 31 Days of Prayer for Husbands with a chocolate giveaway. Her thoughts and the prayers reminded me of the time I felt I was losing my own dear hubby and I prayed so fervently for him to find his way back to God, and to me. My prayers were answered, and in true God style, so much more abundantly and wonderfully than I would have dared to hope. Jenn at Fruitful Vine, was feeling guilty about missing quiet time with God, and was encouraged by Daniele's post on Domestic Serenity, challenging us to see everyday activities as chances to get closer to God and meditate on his wonders. Those blogs reminded me that becoming a Godly wife or mother is truly a sacrifice to God. It isn't always easy, but it is a sacrifice and dedication that God does truly honor. As I finished law school with a kindergartner, newborn and police hubby, I asked the Lord to show me His plan for me. I tried my hand at public service, but in the end, God's whisper became a shout that my place was at home, raising the kids and supporting my hubby. It was blow to the ego, a loss of status and a hit to the bank account. But, everything in my life has lined up with this decision. Our finances, my parents' health, the kids' education, all ended up moving in ways that confirmed that this was THE plan. So, folding the laundry is not quite as exciting as arguing points of law. And there are no promotions or bonuses for a job well done. That is a struggle. But I have found that folding laundry and rinsing dishes can be a time of meditation, when I can sing praises to God, or hear His still, small voice. And, for sure, my time at the drawing desk is very spiritual and meditative. But so is an evening around the fire pit with the family after a day of exhausting yard work. Lord, teach me submission. Help me to humble myself and serve others as You did. Help me put my plans and dreams in Your hands, and let You work through me to bring You glory and honor. Amen! I was listening to Billy Graham on the radio this morning, imploring his audience not to wait to come to Christ. You never know if this day might be your last, he said. And that got me thinking about my own path to Christ, and how long and winding it was. And I started praying that Billy Graham's audience would not wait, and waste valuable time like I did. And it made me remember that I was so afraid that my life would change, and I would give up control and I would not be able to experience things that would bring me happiness if I gave my life to Christ at 17. Do you know that at that moment, the next show came on the radio, and the speaker gave another message on not waiting to commit to Christ. And he said the exact thing which had been my next thought: If God loves you and wants the best for your life, if He knows exactly what will ultimately bring his human creations the most happiness and joy, why on earth would we want to spend even one more second without that?! That's something in the Good News that I seem to have missed for many years -- God knows best. Giving up control over your life is a scary thing, but it's like a flight trainee giving up control of a Jumbo Jet to an experienced pilot with combat experience. You might fly through some turbulence, but there's no way the plane is going down. So many of us think we know what will make us happy, but in reality, we are so often wrong. Certainly what the culture tells us of happiness is badly warped. To my mind, what happens in Vegas will never stay in Vegas, because all those miserable souls will eventually have to go home to reality and reap the consequences of their decisions. The Bible is not an authoritarian rule book of dos and don'ts. It's God's love letter to us. It's His promises to care for us, provide for us, save us over thousands of years. God's rules are not there to ruin our fun, but to help us find true peace and joy. I can attest to this in my own life, for sure. And not a day goes by that I don't wish that I'd made that decision sooner, because I'd be farther along on my journey, and just a little more like Christ. 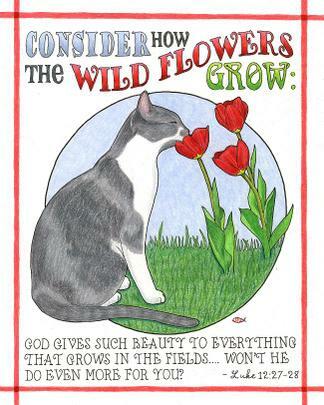 If God gives such beauty to flowers in the field, that are here today and gone tomorrow, won't he do even more for you -- His own dear child? Dear Lord, thank you for accepting us as your children at any stage in our lives. Thank you for giving each of us a purpose in life and a way to bring you glory. It is so wonderful that you've given us Your Word and Your Spirit to bring us closer to You, and put us on a path to true happiness and peace. Amen!